On the north side of Kraków’s Old Town, far away from the Wawel castle hill, and at the end of busy Florianska Street that runs from the Rynek Główny main square, to the outer edges of the city’s medieval centre, stands the remnants of old Krakow’s outer fortifications. For several centuries the city of Kraków was the political and monarchic centre point of Poland, and later, the Lithuanian Commonwealth, making it high on the list of ‘must-conquer’ cities for any would be invader. Consequently, from the 13th century onwards, the city began a comprehensive defensive building program that saw the Old Town and Wawel Hill entirely enclosed in more than 2 miles of defensive wall. By the time it was finished, the fortifications were adorned with nearly 50 defensive tower outposts (of which three still remain standing today), and 8 heavily guarded gates, only some of which were used frequently. On this north side of the Old Town, outside the busiest gate on Kraków’s defensive circuit, and now nestled neatly in the Planty Park that runs right the way around the city’s historical centre, visitors can find the impressive and forbidding structure of the Barbican. This circular building of almost 25 metres diameter was completed in the 15 century to further increase security on St. Florian’s Gate, which led to the so called Royal Road running the length of the Old Town, right to the entrance of Kraków’s castle complex on the hill. Today, the Barbican is perhaps Europe’s best preserved example of a medieval outer-wall fortification post. With a little imagination it’s easy to see how daunting the structure would have been for a hopeful attacker. There are over 120 embrasures, 7 turrets and a protruding frontal gate loaded with hot oil traps and impenetrable, gothic portcullis. What’s more, while it may be possible today to sit with a coffee in the Planty, admiring the architectural continuity of the Barbican and the Old Town walls that jut out eastwards from St. Florian’s Gate, in the 15th century the park was non-existent, and in its place a deep moat divided the city’s inner defensive wall, from the outer fortifications, of which the Barbican formed a part. 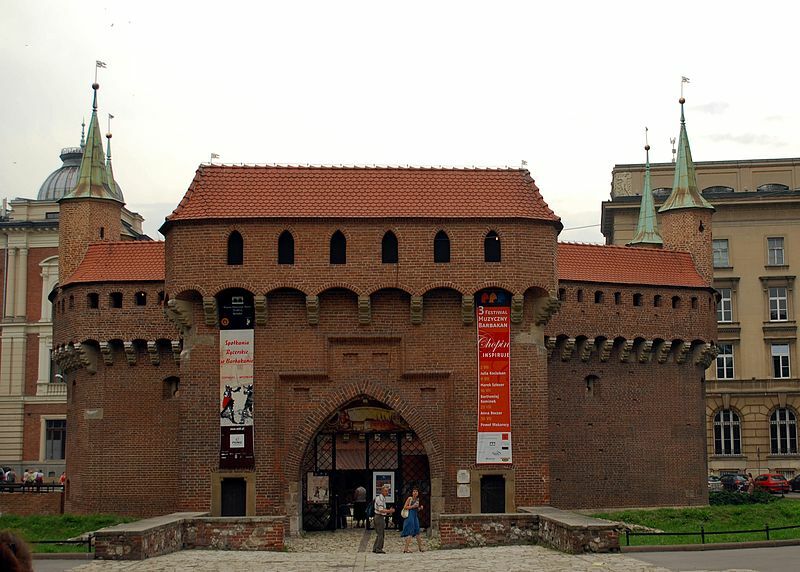 Like most of Kraków’s notable buildings, the Barbican too has a heroic tale to tell. Supposedly, one Marcin Oracewicz, a local Cracovian who zealously defended his town from the invading Russians, found himself entirely out of ammunition atop the Barbican. It’s said that Oracewicz ripped off his own jacket button and loaded it into his rifle, only to kill the enemy commander and end invasion hopes with one foul swoop. Today his ingenuity is hailed as a heroic feat that helped saved the city, and he’s commemorated with a plaque outside of the Barbican. The building is now home to some of the permanent exhibitions of the Kraków museum, and is used for a number of open-air theatrical events throughout the year. Entrance is just 6 PLN, but sitting outside and admiring the vestiges of medieval might that still adorn the outer edges of Kraków’s main town is often a journey in itself.